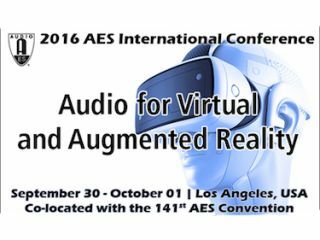 The inaugural AES International Conference on Audio for Virtual and Augmented Reality, to be held on September 30 and October 1, 2016, will be co-located with the 141st AES Convention at the Los Angeles Convention Center’s West Hall. The two-day program of technical papers, workshops, tutorials and a manufacturer’s expo will throw a spotlight on the creative and technical challenges of providing immersive spatial audio to accompany virtual-reality and augmented-reality media, which is demonstrably the fastest-growing section of the entertainment-audio markets. The conference will bring together content developers, researchers, manufacturers, consultants, and students, in addition to audio engineers seeking to expand their knowledge about sound production for virtual and augmented reality. The companion Expo will feature displays from leading-edge manufacturers and service providers looking to secure industry metrics for this emerging field. The conference program will provide an overview of the AR/VR creative process, applications workflow and product development, while creating an activity hub to focus attention on the expertise the Audio Engineering Society can offer these expanding creative communities. Costs range from $195 for a 1-Day Pass for AES members ($295 for a 2-Day Pass) and $125 for accredited students, to $280/$435 for non-members; early-bird discounts also are available. The conference will be held within a recently-remodeled 300-seat theater and companion seminar room at the LA Convention Center. The entrance from the main convention lobby will offer a dedicated attendee registration check-in and related facilities. Conference registrants can also attend the 141st AES Convention’s companion exhibition and select educational sessions and special events free of charge with an Exhibits-Plus badge.